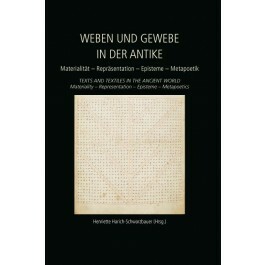 Texts and Textiles in the Ancient World: Materiality – Representation – Episteme – Metapoetics presents 12 papers arranged under the four headings of the title which focus on the process of textile manufacture, the weaving process itself, and the materiality of fabric. Contributions adddress the problematic issues of cognitive archaeology, consumer research, literary theory and themes addressing both philosophical history and the history of reception of ideas and practice. The contributions seek both to close the critical gaps with respect to weaving, a broad and complex field in the area of ancient cultural techniques, and to identify new themes. Accordingly, the submissions expand our focus into late antiquity, to integrate texts such as letters written on Papyrus detailing the everyday correspondence of an Egyptian family or to spotlight the meaning of textile terms and the history of misunderstandings associated therein. Frequently overused analogies between writing and weaving are also examined in terms of their legitimacy as well as their limits. The papers presented here result from an international and interdisciplinary conference under the same title held in Castelen, near Basel in 2012. 2. Sophie Gällnö: Le tissage dans les lettres privées de l’Égypte byzantine: travail domestique ou activité lucrative ? 2. Marie-Louise Nosch: The Loom and the Ship in ancient Greece. Shared knowledge, shared terminology, cross-crafts, or cognitive maritime-textile archaeology?